Every year, millions of people around the world undergo orthodontic treatments to straighten their teeth. Most people start these treatments as teenagers, but the number of adults seeking orthodontic treatments is steadily increasing. Everyone wants a beautiful smile, but there are several other reasons why straightening your teeth is a good idea. Besides the obvious cosmetic advantages, there are many ways that having straighter teeth is better for your oral health. When your teeth are properly aligned, it makes biting and chewing easier. Straight teeth are also much easier to brush and floss, which helps prevent cavities and gum disease. Only about 35% of adults have naturally straight teeth, meaning the average person could probably benefit from orthodontic treatments. That’s why we’d like to show you how Exceptional Smiles Family Dentistry can give you the perfectly straight smile you’ve always wanted with Invisalign. Invisalign aligners are clear plastic trays that fit over your teeth and can be removed at any time. Several sets of aligners are custom made to fit your teeth as they move and straighten over time. 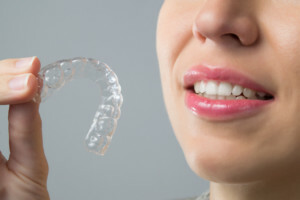 These aligners can fix all the same problems as traditional braces, such as overcrowding, gaps between teeth, overbites and underbites. But they’re better than metal braces for a number of reasons. First, they can be removed. That means you can brush and floss your teeth just like you always do, and makes trips to the dentist much easier on both you and us. Plus, without the metal brackets and wires, you can eat anything you want! 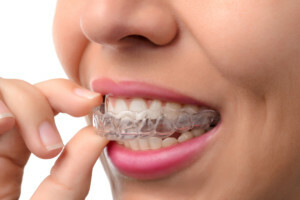 Invisalign aligners are also much more comfortable than traditional braces. The brackets glued to the front of your teeth with metal braces have sharp edges that can scrape and cut the inside of your lips and cheeks. With Invisalign, the trays are thin and smooth so there’s nothing to cause any discomfort. Finally, the biggest benefit to Invisalign aligners is that they’re invisible! Many adults avoid orthodontic treatment because of how traditional braces look. When you’re wearing Invisalign, no one will ever know unless you tell them. So if you’ve always wanted straighter teeth without a mouthful of metal, don’t put it off any longer! To learn more about Invisalign aligners, visit our website to download a free eBook and check out our blog post on the benefits of Invisalign over traditional metal braces. To schedule a consultation and get started on your straighter smile, call our office at (540) 434-5500 and set up an appointment with Dr. Eye today.